The San Antonio Spurs have a signature play to get their best shooters wide open shots. 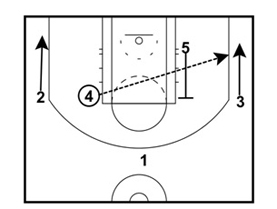 It is called the hammer play because the post player sets a “hammer” backscreen for the shooter. They used this play several times en route to a championship season. The play works best against teams that tend to overhelp on the strong side. 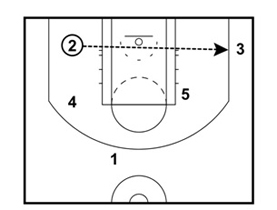 The weak side should be open for an outside shot if the play is ran correctly. The screens must be set at the perfect time for the play to be effective. Be sure to work on this play in practice if you plan to run it in a game. The Spurs can run this play because their core group has been playing together for several seasons. They understand the timing and precision needed to make the pass at just the right time. It will take some time for your team to master this play. Note: this play is not recommended for youth teams. Only run this for advanced high school teams. This play requires a player able to throw an accurate skip pass off the dribble. The play starts out in a basic 3-2 set. 1 passes it to 2 to start the play. 4 sets a ball screen for 2. 2 rejects the screen to go baseline. The goal is to free up 2 for a baseline drive. 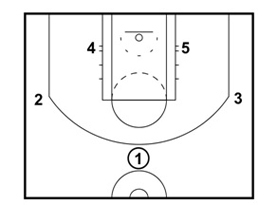 As 2 is driving baseline, 5 sets a “hammer” screen for 3. The screen should be set as 2 approaches the baseline. 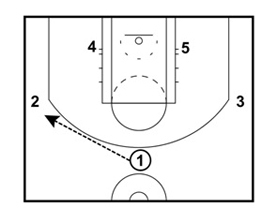 3 runs to the weakside corner as soon as 5 sets the screen. Note: The Spurs like to use Manu Ginobili as the passer since he is left-handed. Switch sides if your baseline driver is right-handed. As soon as 3 gets in position, 2 makes the pass to 3. 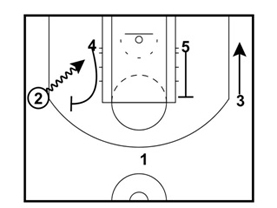 5 should roll to the basket if the defense switches the screen. 4 should position himself on the elbow for a mid-range shot. 1 should be positioned as the safety in case none of the options are available. There are many variations to this play. It can be run from either the high post or the low post. You just need a post player who can make a well-timed skip pass. 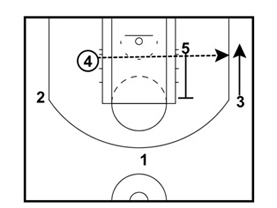 From the high post, 5 sets the screen as soon as 4 receives the pass. 5 can also roll to the basket if the defense switches the screen. From the low post, the screen should be set as soon as 4 receives the ball. 4 needs to face the basket and make a quick skip pass. This really helped I was struggling and was getting yelled at in return. Now I think I understand it much more.